Sure, the title seems paradoxical, but we beg to differ. A few months ago, we began work on a story that we always really wanted to do because it was so universal. It was something that we all could relate to because we’ve all felt the emotion of getting our own “tangible memories.” You might also know them as souvenirs. If there was one thing that all of us had done when we visited our favorite Disney Park when we were growing up, it would have to be asking for a souvenir. You could call it second-nature, but why? Why did we want to buy something that did cost more than a pretty penny sometimes? Why did we cry when we didn’t get that souvenir? We aim to answer those questions with this newest Feature Story straight from the incredible news team and resources here at DisneyExaminer. In addition to speaking to the merchandising team at the Disneyland Resort, we had the incredible opportunity to speak with artist Jerrod Maruyama on his inspiration in creating a tangible memory that we’ve all come to know and love – Hipster Mickey. If there’s one thing that this exclusive story can get across to you, we hope that it enlightens you the next time you buy a souvenir at a Disney Park. 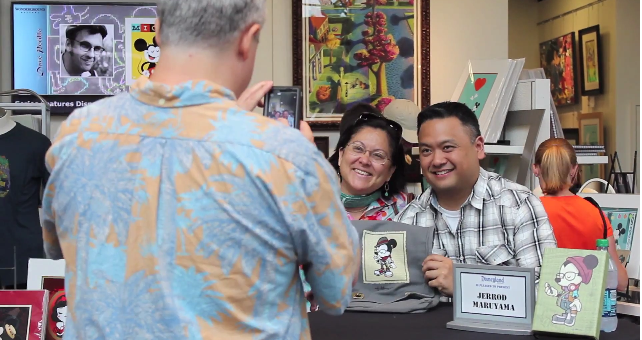 Our special thanks to our friends at the Disneyland Resort (specifically the Disneyland Resort & Downtown Disney District Merchandise and Marketing teams), Jerrod Maruyama, and Nieman Gatus of LightCap Films for all their hard work in putting this great story together. Next story Pixar Symphonies (a DE Mini-Feature Story) + Giveaway!